Lord Roberts of Kandahar, V.C. A cabinet card portrait of Frederick Sleigh Roberts (1832-1914), created 1st Earl of Kandahar, Pretoria and Waterford in 1901. During the war in South Africa, he served as the last Commander-in-Chief of the British Army. Born at Cawnpore in India, he was the son of General Sir Abraham Roberts. Educated at Eton, he entered Sandhurst in 1847 and then attended the East India Company’s college at Addiscombe. In 1851 he joined the Bengal Artillery. During the Indian Mutiny, Roberts was at the siege of Delhi and at the second relief of Lucknow. He won the Victoria Cross at Khudaganj in April 1858. During the years that followed he rose steadily in rank. In 1879-1880, during the Second Afghan War, he undertook a march from Kabul to Kandahar, transporting 10,000 soldiers and 8000 camp-followers over 300 miles in 22 days. 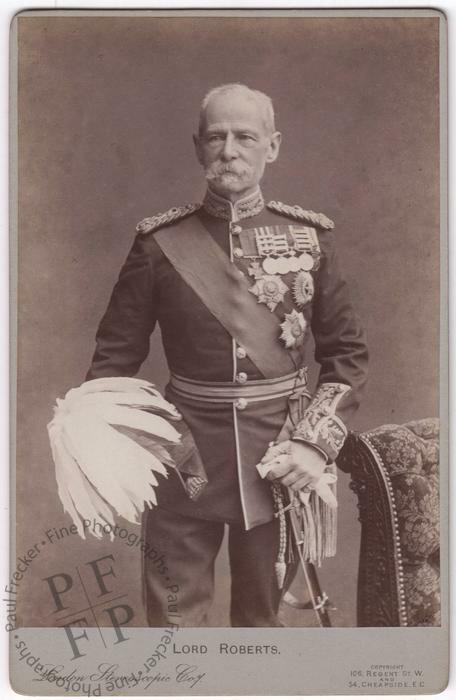 He was commander-in-chief in Ireland (1895-1899) before assuming supreme command (1899) in the Anglo-Boer War. His services were distinguished, and he was rewarded with an earldom. At the outbreak of the First World War he became the Colonel-in-Chief of Overseas and Indian Forces. He led an Indian expeditionary force dispatched to France in 1914 but died at St Omer on 14 November 1914. He was buried in St Paul’s Cathedral. Photographed by the London Stereoscopic Company. Condition: the print presents slightly mottled tones in the area of the background but is otherwise in excellent condition, as is the mount.